← Hot Day, Warm Cucumbers! Marinated vegetables usually remind me of mushrooms dripping with oil, plus already-soggy white bread on the side. Yet a 1980s recipe from the Richmond Times-Dispatch tempted me because in the past month, I’ve eaten enough crudités to feel like Peter Rabbit. This Marinated Vegetable salad, sent in 30 years ago by former Times-Dispatch food editor Jann Malone, comes from Great Ideas for Barbecues & Summer Meals (Family Circle, 1983), the same book where I found the candied tomato recipe from my friend’s mother. Though the recipe goes back at least 30 years (the dressing comes Malone’s father, so it probably goes back farther than that), it managed to update my ideas about marinated salads. The practice of flavoring and preserving vegetables in vinegar goes back to ancient Greece and Rome, according to kitchenproject.com. Early Virginians, including Thomas Jefferson, also ate pickles. Interestingly, a whisked-together combination of oil and vinegar did not become known as “French” dressing until around 1900. But now many American restaurants call it vinaigrette. Times change, but not the basic concept of the dressing. The marinated salad recipe would work well with almost any kind of late summer vegetables (except tomatoes, which would get too mushy). The veggies turn out crisp-tender instead of soggy. Pick, steam, marinate. Just give yourself several hours to let everything chill before serving. Seed the pepper and slice into thin strips. Slice the carrots and squash into thin rounds. Thinly slice the green onions, using both the white and green parts. 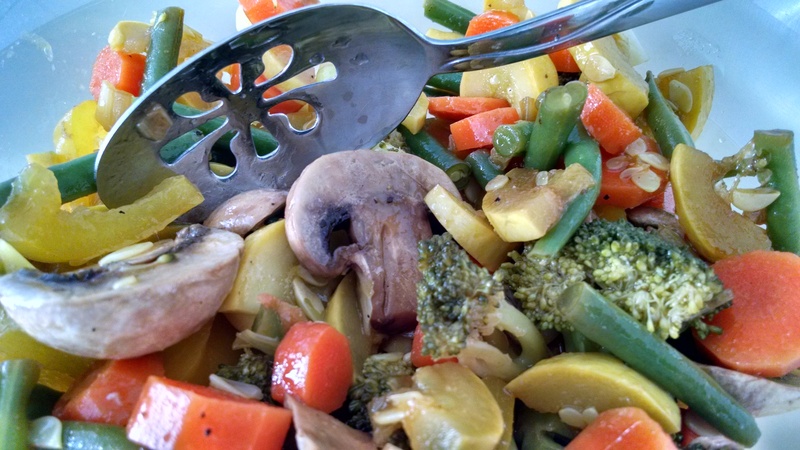 Lightly steam all the vegetables except the onions and mushrooms for no more than 3-4 minutes. Dump the vegetables into a colander and run cold water over them to halt the cooking process. Combine all the vegetables in a large bowl or jar and pour the dressing (from recipe above) over them. Refrigerate for at least 4 hours or overnight. Drain before serving. The salad looks nice and travels well in a large glass jar. This entry was posted in cookbooks, Food, history and tagged 1980s, broccoli, carrots, cauliflower, French, Richmond, salad, Thomas Jefferson, Times-Dispatch, vinaigrette, Virginia, yellow squash. Bookmark the permalink.